Classic Carriage is owned by Matt and Stacie Hickey and is based in Staunton Virginia. 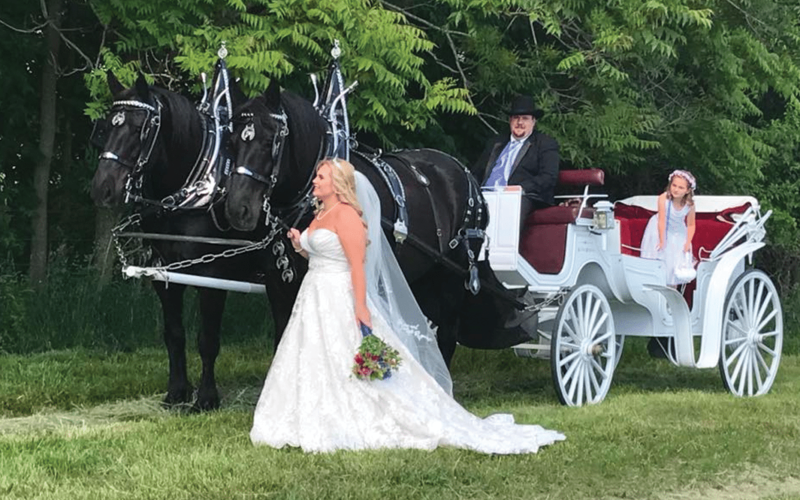 Classic Carriage has provided many memorable ‘Dream-Come-True’ events in the Staunton/Harrisonburg, VA area as well as in Manassas, Alexandria, Fredericksburg, Winchester, Front Royal, Woodstock, Broadway, Richmond,Charlottesville, Waynesboro, Staunton and Franklin, WV. We at Classic Carriage desire to always provide excellent service to our clients. You could call it an obsession. Everything from the appearance of our Coachmen, to being prompt in getting to your event on time, our desire remains the same: Provide you with the best customer service possible and make your carriage ride one to remember. Our teams are accustomed to working calmly and dependably around busy traffic and in unexpected situations. All Classic Carriage’s horse drawn vehicles are equipped for road safety and have lights for night driving.